After a show - Wow, you send just like Seth Rogen....like the Italian Seth Rogen" Thanks? @bestcomedytix @DarkHorseComedy thanks so much. I would love to see people at the shows. RT @TribecaComedyLg: Sold out show tonight at @DarkHorseComedy and no wonder with this line up: @patdixon @drewmichael @katiehannigan @VinJamesComedy! Going to see @KevinHart4real in my hometown of Port Chester, NY Oct 12th. Would be a whole lot cooler if I was his opening act - Next time. I randomly guessed this couple in the front rows names at a show. I apparently start cursing in joy and ask the audience for my own applause when this happens! Westchester's own, yours truly, is heading back to the Yonkers Comedy Club on Friday, June 15th at 7:30 and bringing some of my friends. Tell your friends, get a babysitter, and sit back and laugh. We could all use some! There will be a Very Special Champagne Toast at the End of the Show to celebrate Valentines Day! 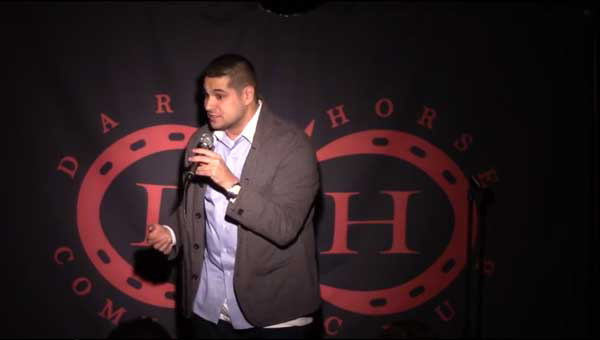 A clip from a show I did in February - I make fun of Fifty Shades of Grey!